Technomad LLC, a leader in advanced loudspeakers and audio systems since 1995, is adding more power to its range of PowerChiton weatherproof outdoor amplifier modules. Able to produce 1600 watts for 8-ohm systems and 1800 watts for 4-ohm systems, the new PowerChiton4 offers more than three times the power of the current highest-power model (500 watts) in the same compact, NEMA-enclosed package. The PowerChiton, with its IP66 protection classification, is a practically bomb-proof amplifier-in-a-shell. The IP66 rating confirms ingress protection (IP) for persons (such as electrical safety) and equipment (dust, dirt and water penetration). 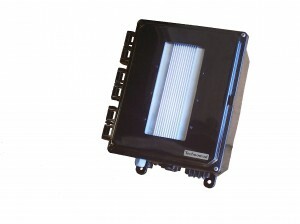 The latter makes PowerChiton amplifiers ideal for outdoor installations for protection against the elements. Its low-profile, modular design also gives systems designers and integrators the freedom and flexibility to place the amplifiers closer to the loudspeaker (including wall and pole-mount systems) without hassle – or to install the modules to the back of the loudspeaker with specialized hardware. The PowerChiton4 retains all of these protection features while vastly increasing power, creating new opportunities for designers and integrators to specify and install PowerChiton amplifiers within distributed audio systems. The PowerChiton is a nearly bomb-proof, amplifier-in-a-shell. The new 1600 watt PowerChiton4 begins shipping in July. All four PowerChiton amplifiers (including the 130- and 250-watt modules) are available with three networking options: Ethernet/IP, RF (wireless) and twisted-pair. Its efficient design employs a single passive radiator for amplifier cooling and eliminates all moving parts to minimize failure points. Other features include a high-quality line level input for improved site-wide audio that is ideal for both voice (paging) and musical output; and a second input that can be used for local audio or as a secondary audio source. An internal mixer balances, improves and maintains audio levels out of the amplifier modules en route to loudspeakers. The PowerChiton4 begins shipping in July. Technomad is also developing a powered option for its new Oslo subwoofer based on PowerChiton technology.